Isn’t it amazing how much things you can put inside this coat and how easy it can be converted into bag or back to coat? With it passengers can beat all rising luggage fees as it looks like airlines even don’t think about stopping introduction of new fees. This jacket or bag or coat (I am not sure which word describes it best) is water and wind resistant, it has 14 various sized pockets. That means you can pack into it your clothes, laptop, ipad or other gadgets, books/magazines, i.e. everything you would carry in your usual carry on bag. Some people complain it is not very stylish, but it looks much nicer comparing with Rufus Roo vest and at the end who cares how it looks? It is very practical money saver and you need it just to sneek through check-in gates with all your belongings and nothing more then that. The price tag is the only thing I don’t like about this jacket. At the moment they ask €80 for original Jaktogo jacket/bag, but it can go up to €265 if you want leather version of the jacket. You must be really frequent flyer to get benefits of this jacket/bag and hopefully airlines won’t start weighting the coats and start charging per kilo. 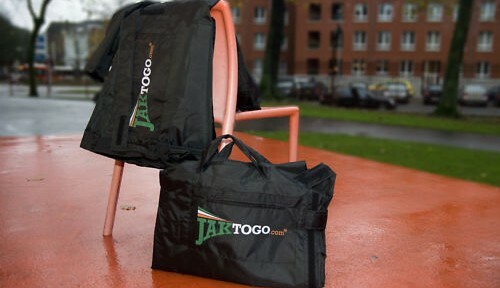 This entry was posted in carry-on and tagged carry on luggage, jaktogo, luggage, wearable luggage on July 4, 2012 by Vi.